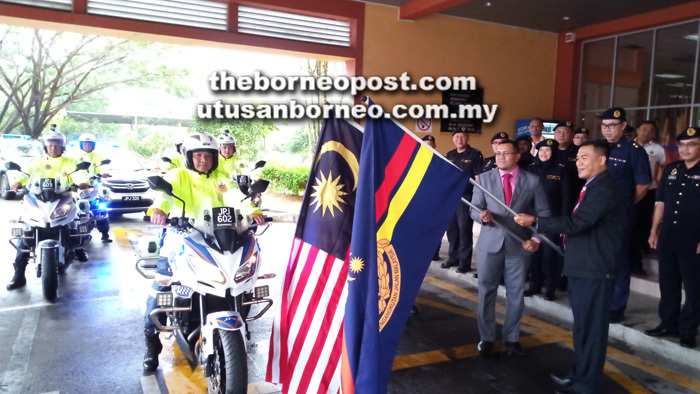 Mohd Syafiq (left) and his deputy Erick Jusiang jointly flag off a convoy as a symbolic launch of the two-week statewide JPJ operation. KUCHING: The Road Transport Department (JPJ) is determined to bring down the number of road accidents in Sarawak during the Chinese New Year period. JPJ Sarawak director Mohd Syafiq Anas Abdullah said to achieve this, 185 personnel will be conducting patrols throughout the state and also placed at major bus terminals, namely Kuching Sentral, Sibu Bus Terminal and Miri Bus Terminal. “Our personnel on patrol will be equipped with a GoPro (action camera) to record drivers who have committed an offence. This will also provide us with photo and video evidence of the offence,” he told a press conference after launching the statewide safety operation in conjunction with Chinese New Year, at JPJ Sarawak headquarters here yesterday. Mohd Syafiq said patrols will be conducted at various road stretches to catch speeding motorists, traffic light jumpers and those who commit other offences which could endanger themselves and other road users. JPJ, he added, is also working to reduce the number of roadblocks during this period to avoid causing traffic jams. Touching on the three major bus terminals, the state director said JPJ will be working together with the National Anti-Drug Agency (AADK) and Immigration Department to conduct spot checks on bus drivers. “The spot checks on bus drivers are in addition to our regular checks on the safety of buses, where JPJ personnel will go undercover as passengers,” he said, adding the joint effort with the other agencies is to ensure that bus drivers are not under the influence of drugs or alcohol. As for the involvement of the Immigration Department, Mohd Syafiq said it is to ensure bus companies do not take advantage of the large volume of passengers by bringing in more buses and employing foreign drivers to operate them. “The priority is always to have a local driver who is competent and has a valid licence. We do not want bus companies to take advantage of this festive period (by hiring foreigners).” Based on JPJ’s records, he said there will be 466 active buses throughout Sarawak during the festive period. On another note, Mohd Syafiq said JPJ will disallow heavy vehicles such as trailers and cargo lorries from being on the road from Feb 2 to 4, and from Feb 9 to 10. “Lorry containers and cargo lorries from the airport or sea ports can only be driven on the road from 6am to 12am to their destination within the same period. “Heavy cranes and cement mixers are only allowed on the roads between 6am to 6pm. This is to ensure all major roads are clear for motorists, especially along the Pan Borneo Highway which is still under construction,” he said. Meanwhile, Mohd Syafiq said members of the public who encounter someone committing a road offence can lodge a report with JPJ for action to be taken.